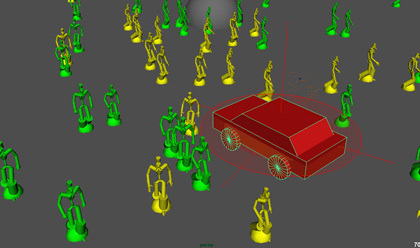 An External Entity Locator is a moving virtual cylinder object which can be taken into account by entities for avoidance when using a Navigation Behavior. 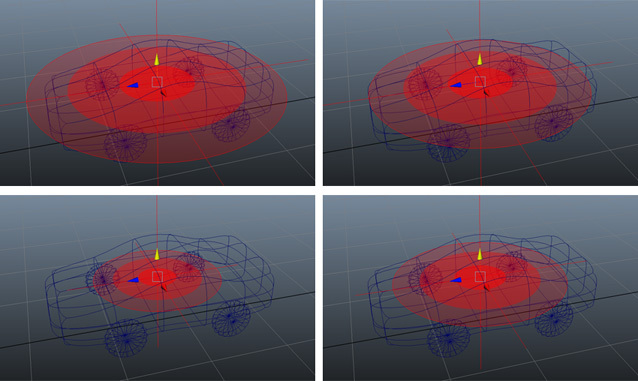 This locator has a position (which is obtained for a tracked Maya DAG object) and a radius. If a DAG Object is selected when the external entity locator is created, locator will automatically use this DAG object as tracked object. If several objects are selected, only the first selected object is used. Tracked Object a Maya DAG object which gives the position of the entity to avoid, it is tracked in position. Custom Radius if the custom radius is used, this field specifies the radius of the External Entity. This attribute can be keyframed. If the External Entity moves faster than Entities, or if Entities are really constrained, they may not manage to correctly avoid the External Entity: thus, collisions may occur. In that case, Entities will be stopped until the collision ends.